In August of 09 we are returning to Uganda for medical clinics, implementation of projects and teaching various skills. Two to three medical clinics (2 days each) are planned. We are currently looking for additional doctors, nurses, aides, dentists, vets and teachers to join the mission. 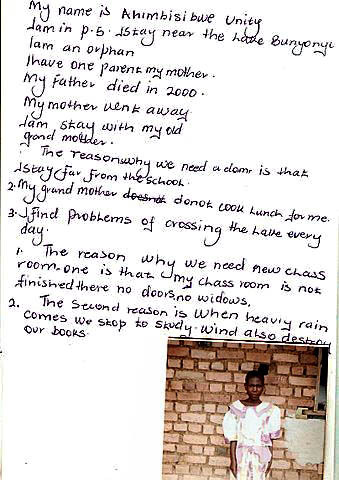 Currently we have a program to send orphans to secondary education boarding schools. These children generally walk 10 miles plus to school, often without shoes and adequate clothing. Their chores at school and in village huts are non ending and leaving little time for studies. Being a boarding student enables them to concentrate on achieving a higher education while not be continously over worked and exhausted. 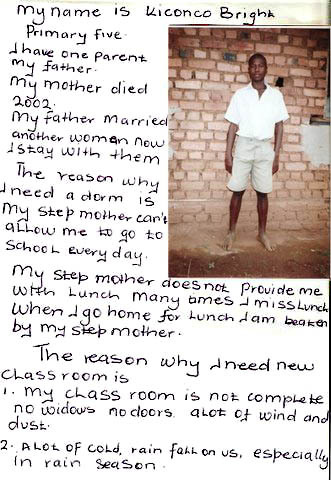 For $400 a year the child receives tuition, uniform, school supplies, books, boarding, medical assistance and food. The money is wired directly from your bank account to the school account. The child and headmaster are contacted by emails and the process begins. This has proved to be a valuable experience for both sponser and student. I hear from my child often and thrilled to share this opportunity. There are many children waiting for your assistance so please contact me. For $350 you can purchase a cut out canoe so Bunyoni Aids Orphans will have school transportation. There are currently 500 children unable to cross Lake Bunyoni in order to go to Burimba Primary School. With your donation this shall make school attendance possible. Burimba School is also on our list to build anew as the structure is unsafe and in deplorable condition. We need $30,000 to construct a new facility. Through original artwork from Ugandan orphans; we shall incorporate same onto t'shirts, hats, watches, backpacks, jean jackets and bags. Paid tuition for primary and secondary school education will be given to selected artists. 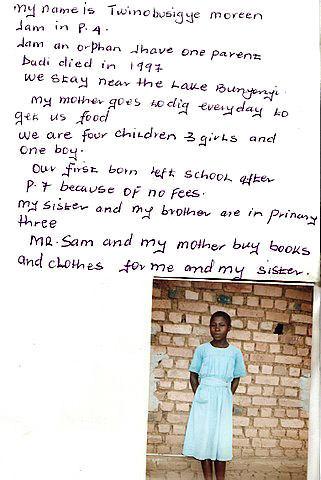 Remainder of funds distributed among various projects to empower Ugandan children and improve the lives of communities. Planned activities include building a new school, dormitories, infirmaries, computers, vegetable/flower/fruit school gardens, poultry houses, medical day clinics, medical assistance courses and installation of filtered water systems. The above mentioned projects are targeted for impoverished school areas/communities near habitats of the chimpanzees and gorillas. African children who are part of our programs shall be taught proper hygiene, nutrition, conservation, self empowerment, independence and the necessities to perpetuate the existence of mountain gorillas and chimpanzees. It is estimated that between 50 to 100 years from now, chimps shall be extinct and gorillas sooner. Teaching the children and making the world aware of the animals fight for survival is paramount. Through the use of computers and becoming good will ambassadors the children shall make a profound impact. Lunch4Lunch: lunch bags sold to U.S. school children so African children can afford lunch. The majority of African children go without lunch and exist on very, very little. We hope to provide for thousands nutritious lunches through subsequent sales. The Lunch4Lunch Program and sales of said merchandise shall be marketed in online and commercial stores ; schools, organizations. media exposure and individual endeavors. Our goals are to partner with an organization to enable our plans to become a reality. Through building schools, infirmaries and dorms....teaching cottage industries as well as providing self grown nutritious food; we hope to enhance the quality of life for the children/community and ultimately save the animals. Training local Ugandans to facilitate the programs and help in the building process is underway. For further information, photos and joined assistance please do contact me. I am sincerely so grateful for your help, time and efforts.